A wonderfully humorous tapestry kit based on a ceramic charger by William de Morgan. 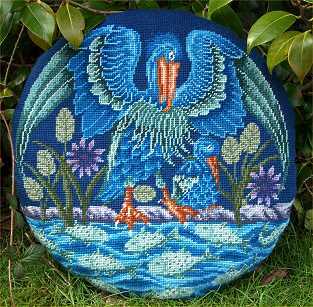 The design features a mother pelican teaching her baby to fish. It dates from about 1888, and was produced in de Morgan's Fulham workshop, London, England. The worked area measures 18" (46cm) diameter suitable for a pillow or cushion. It is available on either printed canvas or unprinted canvas. Kit contains Zweigart (10hpi) tapestry canvas, Anchor tapestry wool, black and white symbol chart, needle and instructions. Zweigart (10hpi) colour printed tapestry canvas, black and white symbol chart and instructions. Black and white chart and instructions. Millennia Designs: Fine needlepoint & tapestry kits inspired by the past.